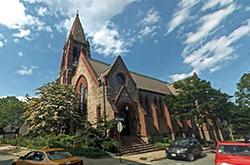 Grace Episcopal Church – Whoever you are, wherever you are on your journey of faith, the grace of God is for you. God's grace is for you. Thank you for visiting our website. We are a vibrant community that seeks to serve Jesus in all people. We truly believe what we say as our invitation to communion: "Whoever you are, wherever you are on your journey of faith, come to the holy table and receive the supper of the Lamb." Please know that you are welcome here at Grace! Maundy or Holy Thursday is the commemoration of the First Eucharist at the Last Supper. 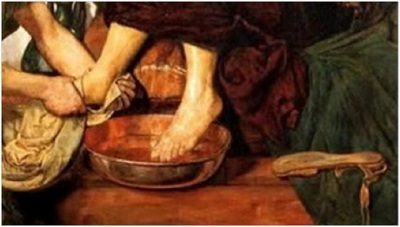 The word “Maundy” from the Latin Maudatum novum, Jesus’ “new commandment” that we love one another, as he has loved us, represented by the act of love: the washing of the feet. At the end of the service, we clear the table, consume the consecrated bread and wine, and strip the sanctuary of ornament together in preparation for the passion and death of Jesus. 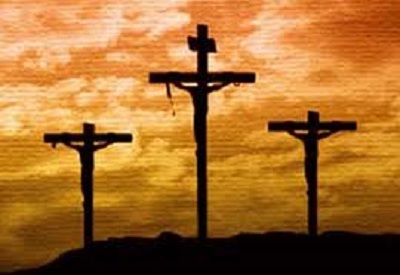 Friday we meditate on Jesus’ sacrifice of His humiliation, torture and death for the sake of our redemption, this story told through the narrative St. John’s passion. We venerate the cross, the symbol of Jesus’ sacrifice and of our faith. At Grace the cross is a relic of the Great Fire. Just as our Church rose from the ashes, we are confident that Jesus will rise from the dead and in the power of His resurrection in our own lives. 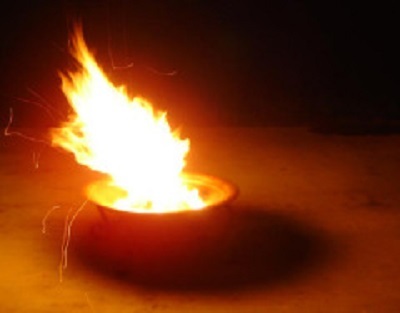 In the darkened church a fire is lit and from that fire the Paschal candle, the symbol of the light of Christ, is spread through the church. It represents the slow dawning after the night within which He rose from the dead. We begin with an ancient hymn called the Exsultet, “Let [the host of heaven] exult!”, expressing the joy of all on earth and in heaven at Christ’s glorious resurrection. The first half is in darkness, while a series of lessons describing the history of salvation is read, interspersed with psalms and prayers. We renew our baptismal covenant. Then the resurrection is announced. 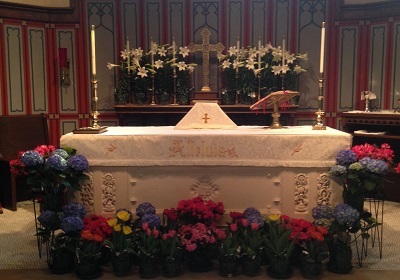 The room is flooded with light revealing that the gloomy veils of Lent have disappeared and spring flowers, risen from the earth, bedeck the sanctuary; bells ring, and the Gloria in Excelsis is sung, leading to the first Eucharist of Easter. Parking: Click here for a parking map.